Volkswagen has unleashed a new GTI ripe for digital hot lapping, and it’s got over 500 horsepower, AWD traction, oodles of carbon fiber, and enough wing to shame a jet fighter. 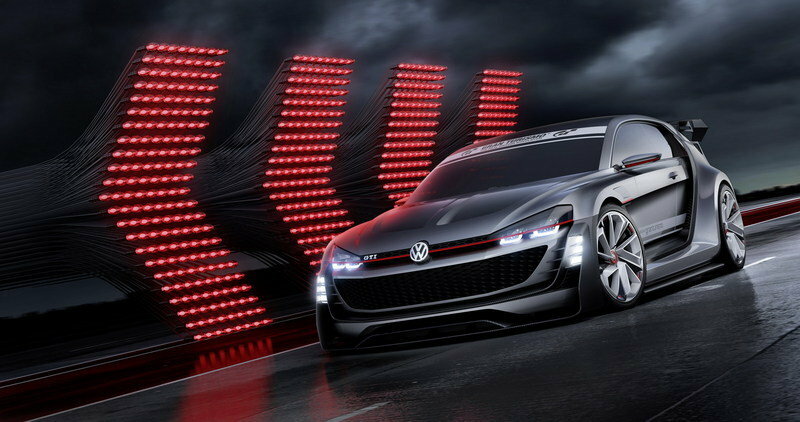 It’s called the GTI Supersport, and it’s part of the Gran Turismo Vision project. 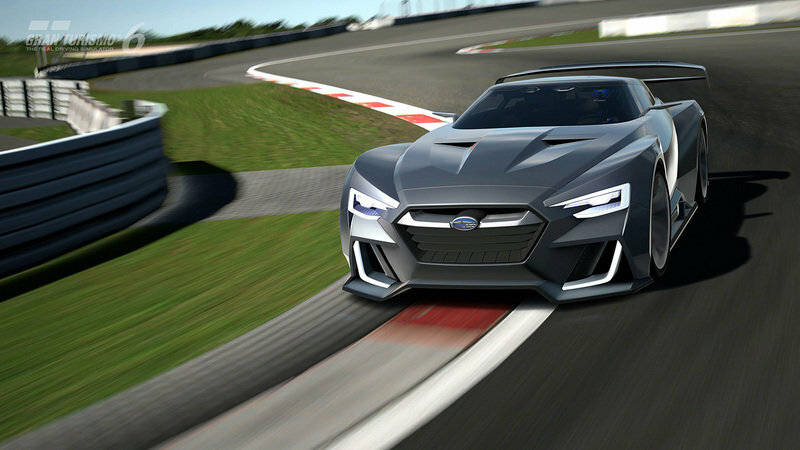 For those of you who may be unaware, Vision is an invitation to every major automaker to produce the ultimate sports car for the GT6 gaming environment. As you can imagine, such carte-blanche freedom has spawned some truly insane creations, and now, this VW will join the party. It all sounds good. But is this Vision worth your precious gaming time? Read on to find out. Continue reading to learn more about the Volkswagen GTI Supersport Vision Gran Turismo. Broadly speaking, the GTI Supersport Vision is very much in line with two-door Golfs found out in the wilds of real life. Squint your eyes and you’ll see the same basic shape and lines. 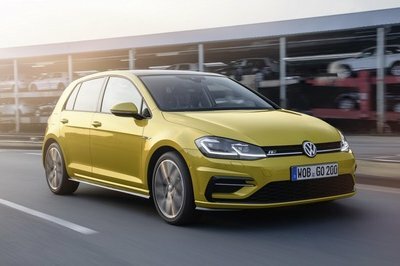 However, in the transition from hot-hatch to supercar, VW has added quite a few details, both aesthetic and functional. The large front air dam is fashioned in such a way as to suggest a maniacal grin, which could be pretty intimidating when seen charging up your six. 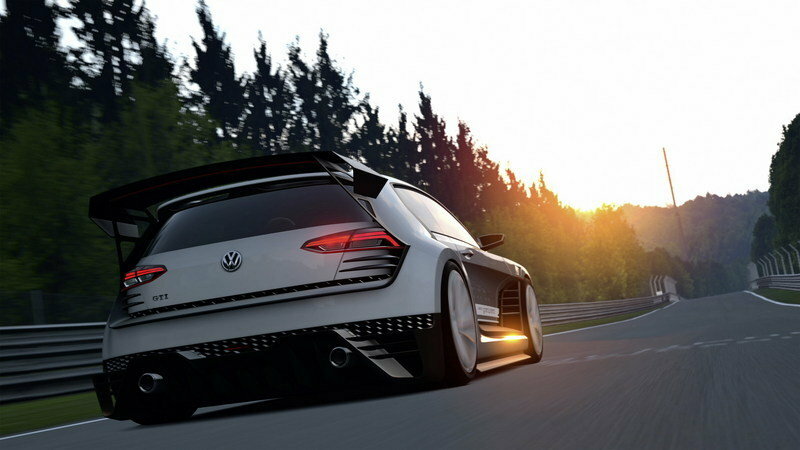 “From a conceptual viewpoint, the entire concept of the virtual GTI as outlined is geared to the physical laws of the racetrack: by intensively optimizing the proportions and body surfaces, the designers managed to achieve superlative performance,” states a post on the Gran Turismo website. 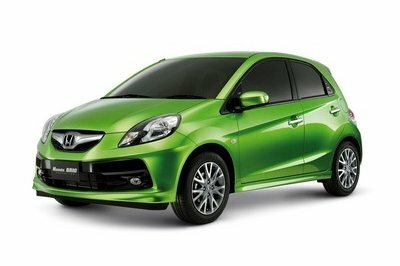 Starting from the front, we find bright, outboard daytime running lights marking the width of the car in a vertical three-squared design. These draw the eye downward to a two-tiered carbon-fiber splitter that juts out aggressively, enhancing the girth of the car and presumably creating huge quantities of front downforce. The large front air dam is fashioned in such a way as to suggest a maniacal grin, which could be pretty intimidating when seen charging up your six. The wheel arch extensions contain vents that encourage uninterrupted flow past the front wheels, sucking the air out to help cool the brake discs. Each aero inlet and outlet incorporates the trademark GTI honeycomb covering. Once you blow by your competitors, they’ll have a brief moment to gaze at the aero fixed to the rear hatch. 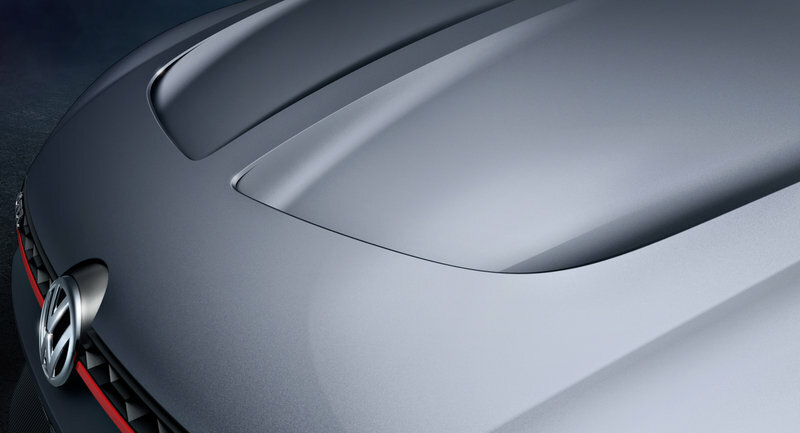 Most noticeable is the huge rear spoiler fixed to the trailing edge of the roof, shaped with creased end plates. This piece should make quite a bit of extra stick in the rear, and has extra bracing that extends down through the C-pillar and into the car’s midsection, shoving the rear axle into the pavement at speed. All of it is made from carbon fiber. 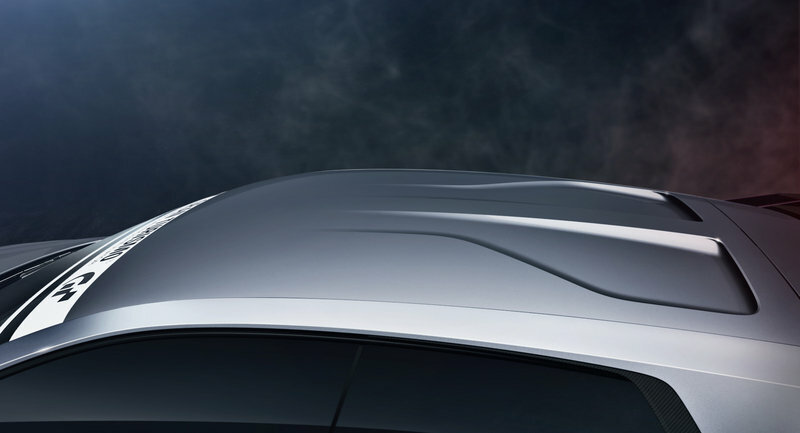 Additionally, the rear half of the roof has been modified to optimize airflow onto the spoiler. Like the front, the rear wheel wells have been enhanced to pull out stagnant air and cool the brakes. The C-pillar has been buffed up, widening the car top to bottom. The rear diffuser is as aggressive as the front splitter, protruding out with a variety of cuts, vents, and swoops, housing the twin exhaust in additional carbon fiber. The taillights are flattened as an adaptation to the new body. 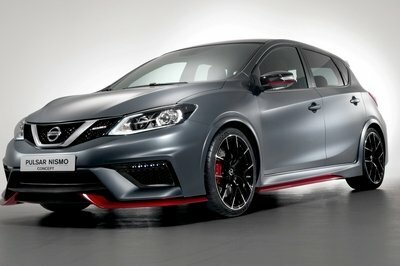 Filling the extended wheel arches are massive 20-inch GTI wheels made from metal alloy and carbon fiber. These rollers have a multi-piece, five-spoke star design, and look both funky and geometric. Classic GTI racing stripes are laid down the car’s flanks as homage to the Golf GTI I, while the black film around the window edges are done in carbon-fiber-look material. Exterior colors include four options, including Reflex Silver, Gran Turismo Red, Lapiz Blue or Oryx White. Few details on the interior of this digital uber-hatch have been released, but VW has said it comes with a “helmet compartment” to store your vital headgear and a “racing tank” (perhaps they mean a fuel cell?). The real question is whether or not the cabin of the GTI Supersport Vision is stripped or streetable. The aero suggests a race-only lifestyle, but does not necessarily confirm it. After all, there are plenty of real world examples where DTM-spec body kits run wild in public. My guess is that the interior remains intact, and if it can be made to pass emissions, the car may be usable for street duty. Then again, this is a video game car, so who cares? Mounted under the rounded and be-winged nose is a VR6 TSI gas engine. This V-6 displaces 3.6 liters and in stock (real life) form, produces up to 300 horsepower and 260 pound-feet of torque. The GTI Supersport Vision, however, adds a huge amount of boost to help crank out 503 horsepower and 490 pound-feet of torque. When routed through a seven-speed dual clutch gearbox, this grunt pushes the lightweight hatchback to 60 mph in 3.6 seconds, with top speed of over 186 mph. Traction is assisted by a permanent 4MOTION all-wheel drive system. VW says the power-to-weight ratio is a tick over 5.51 pounds per horsepower, which means this car weighs only 2,767 pounds. Making the thing handle is a suspension set-up “…tuned specifically for the Gran Turismo racetracks,” which probably means trick coilovers, gumball race tires and copious bracing. Getting a high-powered AWD car to handle properly on a racetrack is no easy feat, especially when building off a road-going GTI. But given the sideways loveliness on display in the promo videos, odds are the outcome is just right. Still, the slammed body equates to zero suspension travel or ground clearance, so you should probably steer clear of the rumble strips. All that carbon fiber on the exterior keeps the curb weight to a minimum, while what mass the car does have is carried low in the body. VW says the power-to-weight ratio is a tick over 5.51 pounds per horsepower, which means this car weighs only 2,767 pounds. 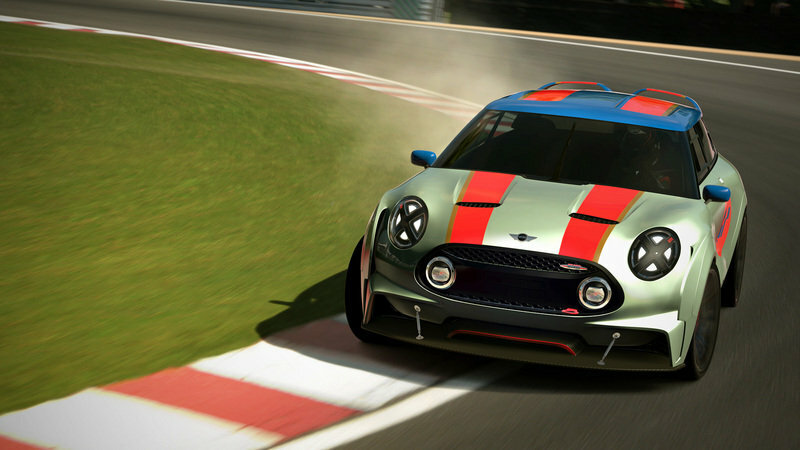 If you’re talking about digitized racers with three doors, AWD and way too much power, you gotta mention the Mini Clubman Vision. On the outside, the cuteness factor is torn asunder by downforce-generating aero like enlarged air inlets, louvers, and spoilers. The underbody is flat, reducing both drag and weight. Under the hood is a 395-horsepower powerplant (specifics are scant, but probably a turbo four-banger) that sends twist through a six-speed sequential gearbox and permanent ALL4 all-wheel drive system. 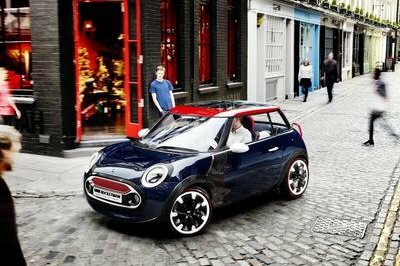 That’s good enough to propel this Mini to 60 mph in 3.5 seconds and reach a top speed of 180 mph, which is right in the neighborhood of the VW. We’ve heard plenty of people poo-poo Subaru’s styling cues through the years, but it appears as though all that pent up creativity was unleashed in the design of the six-star’s Vision concept. 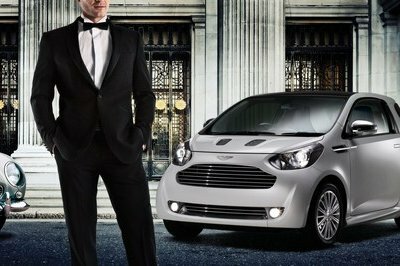 Not only is the aero big, but the body panels are hugely angular and sharply cut, like some kind of polygon gone awry. Making the go is Subaru’s iconic 2.0-liter flat-four engine, which has been boosted with a huge turbocharger and two electric motors to provide 591 horsepower and 593 pound-feet of torque. With just 3,042 pounds to motivate, that should help this AWD monster reach 60 mph in around 3.5 seconds and peak out at 180 mph. We’ve seen some pretty wild ideas come out of the Gran Turismo Vision project, including the VW roadster GTI unveiled last year. By comparison, this particular vehicle is more like a SEMA dream incarnate, with a wild wide body made from carbon fiber, huge aero, and a plenty of performance. However, next to something like the Chevy Chaparral 2X or Mazda LM55, the GTI Supersport Vision is a bit… well, for lack of a better word, tame. Yes, it’s still pretty outrageous looking, and packing more than 500 horsepower into a hatchback is more than substantial, but I like my Vision cars to be completely out of this world. Where is the laser-powered drivetrain or open-cockpit? I want gun turrets and rocket boosters instead of another big wing, and I can’t shake the feeling that this is a bit of a lost opportunity. Still, this concept is the right formula to appease all the Golf fanboys, which is probably all it was meant to do anyway. And who knows? Maybe the lack of a hyperdrive means the GTI Supersport Vision is a preview of things to come. We can only hope. Volkswagen is expanding its GTI fleet and sending a new supercar onto the digital race circuit. The engine roaring under the bonnet of the GTI Supersport is a 503 HP VR6 TSI coupled with a seven-speed dual-clutch gearbox (DSG). The design of this digital supercar combines the Volkswagen icon with sheer racing design. Following last year’s roadster, another version of the GTI, with its long racing tradition, can now head for the starting line on Gran Turismo®6, exclusively on PlayStation®3. The first impression of this racer already shows that the Supersport is what fans want and is designed for racing. 665 Nm of torque catapult the virtual GTI to 62 mph per hour from a standing start in only 3.6 seconds. At full throttle, the virtual racer reaches a top speed of over 186 mph. The gigantic power output is transferred to the virtual asphalt via 4MOTION all-wheel drive and 20-inch GTI advanced alloy wheels. The sixth generation of the legendary racing game available exclusively for PlayStation has been on sale since 2013. The fleet includes almost 1,200 different vehicles which can race on a total of 37 circuits.